We have recently rescued a dog from the Cape Verde islands. These are former Portuguese colonies mid-way between Portugal and Brazil. Many dogs live and breed wild on the islands where conditions are warm but food and water are both scarce. The local Mayor and some hotels poison dogs with strycchnine on a regular basis, when numbers increase. Brando is now two years old and weighs 20kg. (44lbs) He is an amazingly fast and agile dog with a very strong sense of smell. He can leap over rocks, climb rock faces. jump onto sand from 2 metres high (6 feet) and loves digging sand to unearth small crabs. He loves water and can swim well but does not always choose to do so. Since I first wrote this I have learned much more about Podengos and what they look like. I have also learned how to upload photos. I think that it is clear that these two are brother and sister. from different litters. I think that it is also clear thet they have Labrador genes. But their very compact size, sheer speed, energy and agility suggest that they are a cross with another Portuguese breed - as this is what we have in the islands. The obvious candidate is a Podengo Medio, somewhere in the parentage. Both love to hunt and Niki chased the first seagulls that she had ever seen for two hours as dusk was falling on a Devon, England beach, staring up at them as they flew 20 ft above her and racing endlessly backwards and forwards whenever they landed. In appearance, he has a smooth thick biscuit-coloured coat. He has a white patch on his forehead and a white tip to his tail as well as white socks. In London he is keen to chase squirrels and urban foxes. He has a remarkable sense of smell. We believed that he is a Labrador cross - he looks like a puppy but is much too small for a Labrador male. By chance we met a rare Podengo Pequeno at the vet in London. They liked each other immediately despite a disparity in size. The more we looked at the pure Podengo Pequeno the more we identified characteristics of Brando. We now believe that he has Podengo Medio genes mixed with Labrador. Portuguese fishermen brought these from St John`s Newfoundland to Sal from 1905 on to collect salt to make cod into Bacalhau. A lot of feral bred dogs tend to have a similar look to the podengo. Ok , so I went and googled the dog. There's nothing that would make me think Podengo about him , he honestly looks very much like a Lab to me. Obviously part Labrador. But his behaviour exactly fits the description of Podengo Medio. He is much faster, more agile and a better digger than any Labrador. We have been trying to work out where the rest of him comes from. And we had drawn a blank. None of the dogs in Cape Verdes are pure bred - nor are any of the humans. They have been intermixing randomly for four centuries. 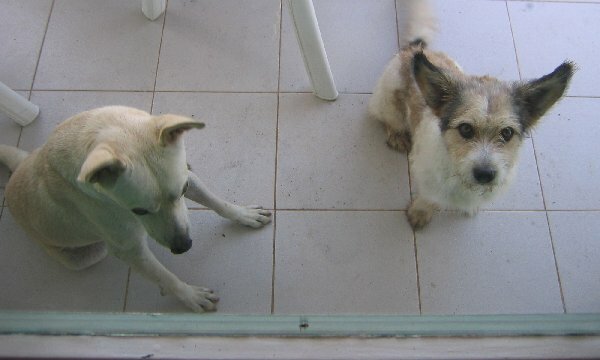 But a lot of the Cape Verde dogs look much more strongly Podengo than Brando. And perhaps the Podengo arrived in the islands with Portuguese sailors who used them to hunt rats on their ships. Brando`s sister recently caught three rats. It is just a theory, but we call him a Labradengo. We have now rescued Bianca another Labradengo, who now lives in Wales. She weighs just 20lbs, but can run as fast as a whippet. Since the time of Cristoforo Colombo Portuguese fishermen and seafarers have been visiting the Cape Verde islands. Until very recently when transatlantic yachtsmen started to abandon their pets on the islands the gene pool must have been very limited. We know that the Portuguese brought Labradors, then known as St John`s Water dogs from Newfoundland to guard their nets and we can assume that they brought rats. As there are no mammals native to the islands can we assume that they would have brought Podengos to catch the rats both on their ships and in their early settlements. The local dogs are remarkably uniform in size at around 20 Kgs ( 44 lbs) but much less when thjy are starving as so many are. They have a fairly standard look to them. Maybe as you suggest this is just the look of the feral dog. But I prefer to believe that they are repeated crosses from a tiny population of Portuguese seafaring dogs. Prime amongst these I would suggest could be the Labrador and the Podengo. Of course none of the Cape Verdean dogs are pure bred There have never been any breeders. But some of them have reverted to a Podengo-like appearance which always puzzled us as we could not place them being habituated only to British and American dog types. On my next visit I will try to snap one of the more Podengo-looking mutts for your comments. Perhaps the Podengo itself, so diverse in size, hair type and appearance similarly derived from a population of semi-wild dogs in Portugal, over the centuries. We have now met a genuine Podengo in Portimao, Portugal. This was probably a Medio and certainly smooth-haired. He was kept on a farm to catch rabbits. Once he had caught all the rabbits on the farm, the farmers let him go. He was found roaming loose and folorn about the farm and rescued by a young Dane who is living on his pension in Portimao. He was walkimng him on a lead around the marina. Brando met him and there was immediate recognition and liking. I think that they recognised some shared genes. The Podengo was lighter and thinner than Brando but about the same height. He weighed perhaps 20KG (44 lbs). Immensely agile, very affectionate and very much aware of what was going on around him, he reminded us very much of our dog Brando - although we can also see his Labrador features. Sadly there are lots of Podengos in Portgual and some in the Cape Verde islands who are not being well looked after and who need assistance from foreigners who are kinder to dogs, generally than the locals. We are today flying two dogs born wild in the Cape Verdes out to Germany, where they will find a new and we hope happy home. They have already survived two deliberate attempts to poison them with strychnine. Jet (the black one) tussles with Brando whilst Niki digs. Here are two Podengos as they have evolved in the Cape Verde islands from dogs originally carried in ships, perhaps centuries ago, from Portugal. Robbie on the left we believe is mostly a Podengo Medio, whilst Vlekkie on the right is mostly a Podengo Pequeno. They were great friends until the day that they were brutally murdered by eating meat, laced with strycchnine that was thrown into their front yard. Most dogs in Cape Verde emanate from Portuguese originals without much interaction from other European or African dog species.